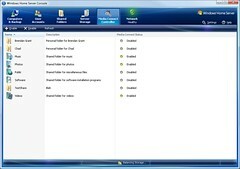 Even though Windows Home Server allows the creation of virtually unlimited shares... it only directly allows exposing of 3 of those shares via Windows Media Connect which enables other devices and PCs in the home to more easily access the content. What happens if a person wants to have two or more separate music or video shares that are all available via WMC? With Media Connect Controller (previously discussed)... this can now change. Due to the release (and subsequent disappearance) of the HP MediaSmart Server More Media Sharing add-in, I was once again reminded of the need for this kind of functionality and wanted to make available this cleaner functioning version that still lacks some of the more advanced functionality I want to add at a later date. The HomeServerControls assembly exposes a type named UIExposedShare which provides much more information (and control) than IShareInfo... one of the methods of control is enabling/disabling WMC for the given share (a topic I'll blog on in more detail another day). Uninstalling this add-in does not automatically revert WMC settings to their original state, instead prior to uninstalling this add-in a user should manually go through and enable/disable WMC for each share as desired. Updating of files in shares may take some time, a reboot of the WHS and/or the receiving device can speed this up. State when set with Media Sharing tab may not be saved when Music/Photos/Videos share was previously enabled through Media Connect Controller. Fully closing the Home Server Console (or rebooting the machine) should resolve this. I don't use the built Connect functionality, I instead use WMP11 on the home server and share my content to my xbox 360 that way. Does this AddIn support my configuration? I do not believe so... however I have not tested that case. Best to stick with one or the other. Am I right in thinking this or more accurately Media Connect doesn't work with a PS3? Great Add-In! I think Option 2 is the best since having too much tabs are so annoying. Great job, looking forward to update! men får inte ljudet o funka bra när det är ac3 ljud på filmerna. Tror bara Windows Media Connect stödjer mp3 till xvid o inte ac3. cylon64, my PS3 sees my WHS just fine, no extra software required. Brendan, thanks for the add-in, this is one thing that always bugged me on the WHS console. how'd you get WMP11 installed on WHS? I've tried in vaine all weekend. any advice would be great! Yea how did you get WMP 11 install that only for XP and Vista. 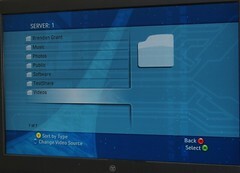 Will this allow for a "Recorded TV" folder of dvr-ms files to be available to Media Center? Excellent job!! This is the one thing above all else ive been looking for. Reasons.. I can now put vidoe files in sepertate folders, for Xbox 360 and Ps3 to play , ie kids Vids and Kids Music and Dads Vids etc. These dad Folders are then block not shared on whs for pring eyes to c.
Yes they can still access them from the consoles but I'm there to see that!! Thanks again for this, works perfect, just a shame Microsoft didnt put in whs as standard. this works great! I too am surprised Microsoft didn't add this in automatically. I guess you could show additional folders in the Videos folder but then why even have a Recorded TV folder? Thanks! Looking forward to additional add-ins. Can't get this to work right with XMBC, no matter how many folders I enable, I still only get Music/Pictures/Playlists/VIdeo to show up.